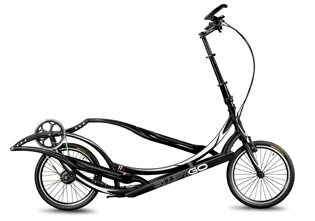 The 8S was the original ElliptiGO model and offers a versatile eight speeds, carbon fiber drive arms, and a folding steering column. Just like the first 8S models that carried the ElliptiGO founders’ signatures on them, the Meb 8S features Meb’s signature and his motto “Run To Win.” The 8S model was retired in 2011, making this limited edition a unique opportunity for customers to own part of ElliptiGO history and celebrate Meb’s victory. The Meb 8S design was unveiled to the public at the festivities leading up to the AJC Peachtree Road Race in Atlanta, Georgia on July 4th. Keflezighi was on hand and raced the first Meb 8S ElliptiGO at Piedmont Park in an exhibition against Atlanta community leaders before it was raffled off to a lucky winner by the Atlanta Track Club. Just 100 Meb 8S ElliptiGOs will be produced and shipped to customers at the beginning of October. Pre-orders are being accepted for this limited-edition ElliptiGO starting today. The MSRP for the Meb 8S is $2,999. For more information about the limited-edition Meb 8S and to pre-order, visit www.elliptigo.com/ElliptiGO-8S-Meb-Edition. For more information about the company and its products visit www.elliptigo.com or follow them on Twitter and Facebook .